The DDBox-50 is a four UHF inputs, one BI/FM input, one BIII input and one full band auxiliary input MATV head-end amplifier. The UHF inputs are connected to 10 selective filters. Each of the filters may be adjusted to amplify a single UHF channel or a group of channels (up to 6) and its gain may be adjusted separately. This bank of 10 selective UHF filters provides an extremely flexible solution to equalize antenna signals of different levels, and provide the correct output level equalisation to compensate higher losses at higher frequencies in coaxial cables. Provides granular UHF signal level adjustment, to reach each user outlet with the correct signal level for each channel. Automatic Output Level Adjustment option (all channels to 115dBµV by default but adjustable from 100 to 115dBµV) is designed to make the installation process smooth, fast and easy. BI/FM and BIII inputs used to amplify TV channels and/or FM and DAB radio signals on those bands. Auxiliary full band input used to combine into a single output cable and amplify external devices as TV modulators or transmodulators. With very high output Level (128dBµV Max. for digital signals) using low intermodulation balanced output stage, and 50dB gain, the DDBox-50 is ideal for small, medium, and large MATV or IRS installations. Fitted with a -30dB test point for in-situ signal level and quality measurements, which do not require service interruption. Fully compatible and transparent to analogue and digital TV signals (COFDM, QAM, MPEG-2, MPEG-4, etc. ), so it can be used installations with both signal types. Digital and analogue signal coexist in the same installation, remember to adjust the digital signals at a level 15dB lower than analogue signals. Housed in a zamak die cast chassis for rigidity, extra interference immunity and heat transfer from inside circuitry to outside (longer components life). Can power antenna pre-amplifiers through each of its inputs at 12VDC or 24 VDC. Built-in Switch Mode Power Supply is designed for stability, cool running and long life. LTE immunity by design. SAW input filters. Android and Windows PC applications for easier and faster Set-Up. 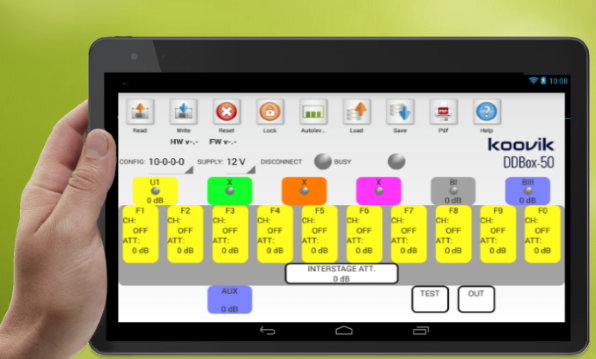 Use Your Android tablet or Smartphone to set up the DDBox-50 using the free App. Search for koovik ddbox on google play store to install it. A USB cable is needed to connect to the DDBox-50. All settings files may be printed or stored in your device for later and faster set-up in similar installations. 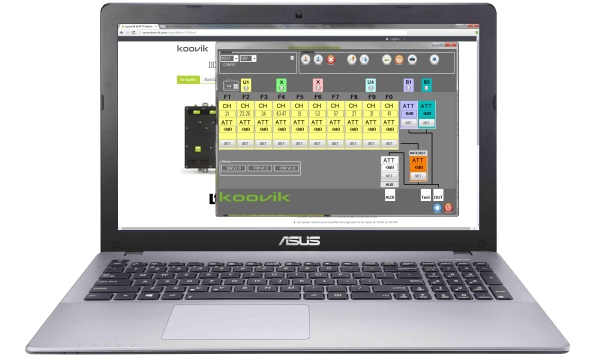 Check instructions and requirements on google play koovik ddbox page. Easy To Use Windows application software. 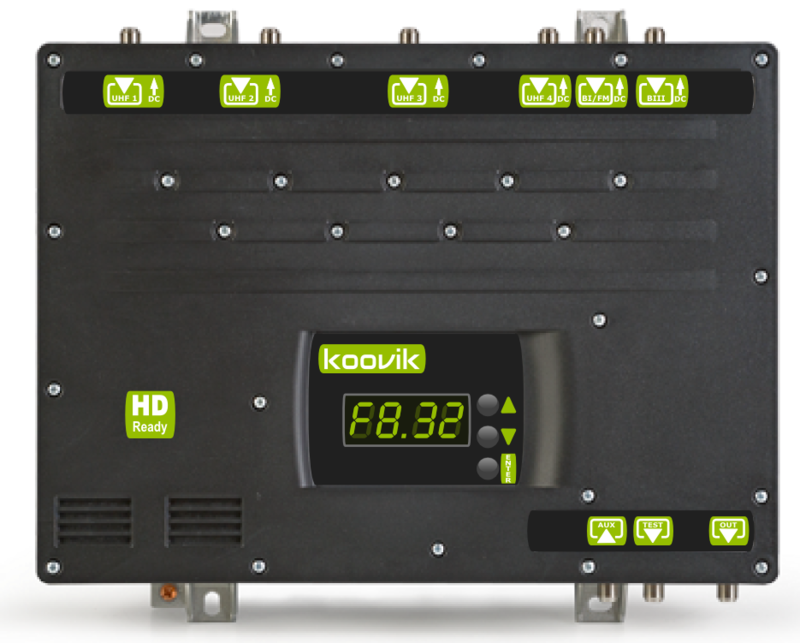 Intuitive universal graphics interface to set-up any DDBox-50 parameter. All settings files may be printed or stored in your computer for later and faster set-up in similar installations. Click here to download the windows software.